Stereo receivers are an essential core that connects all the elements of your home entertainment system, facilitating the components to work together like a well-oiled machine. With a good quality AV receiver, you can power up your surround sound speakers and easily switch signals between your Hi-Fi and TV to deliver an immersive entertainment experience of sound and hi-tech visual effects. While stereo receivers serve a simple function, consumers are spoilt for choice with the availability of a wide variety of receivers. 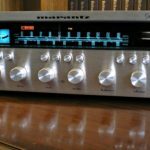 In this article, we provide you with a comprehensive guide on what you should specifically look for when shopping for a new receiver. We also review some of the most popular receivers out on the market right now. If you're looking for an AV receiver check out our page here. This fully kitted out receiver from Denon has all the features that a receiver needs to become a conductor in the great orchestra of an all-encompassing home theatre entertainment system. It comes with in-built WiFi and Bluetooth, which allows you to wirelessly connect it to mobile devices to stream and enjoy high-res music and videos from online sources like Spotify and Pandora. It also enables you to enjoy lifelike visuals and vivid color through the 4K, Ultra HD and 3D passthrough features. You can also switch between different picture modes and tweak the sound compression to either Home Theatre quality, or lower it a bit to enjoy an average movie viewing experience. Although it features 9.2 channels, this receiver has HEOS technology, which allows it to process up to 11.2 channels. Each channel has the capacity to deliver up to 125 watts worth of sound power. In addition to increasing sound output capacity, you can use the HEOS technology feature to create a multi-room network through which to enjoy music streaming from anywhere in your home. HEOS technology, when coupled with AirPlay, allows you to access and stream music directly from your PC or Mac throughout your home network. And just by downloading the Denon AVR Remote App, you can simply control the receiver’s functions from the connected mobile device of your choice, whether it’s a tablet or a smartphone. The sound delivered through this receiver is pure and crisp, thanks to features like low impedance drive, which gives it the capacity to clearly process sound from 4 ohm speakers. Additionally, each of the 9 amplifier channels feature sound processing proficiencies such as 20Hz~20kHz and .05%THD. As if that weren’t impressive enough, this receiver also features a whopping total of 8 HDMI inputs and outputs, which are all compatible with HDCP 2.2 and HDMI 2.0a. Environmentally conscious consumers will like the Eco Mode section of the receiver. The feature automatically alters or reduces the unit’s power output depending on the signal level displayed on the unit. The interactive interface allows you to view the transition so that you get an idea of how much power the receiver is using at any given time. Lastly, audio-video device novices will be happy to know that this receiver comes with a Quick Guide, which allows them to easily set up the receiver upon arrival. In fact, the setup on this is so easy that anyone can do it, and it enables them to instantly enjoy all the amazing entertainment value provided by the receiver. In addition, the speaker terminals are color-coded with accompanying speaker labels to ensure accurate placement. The multi-way connectors make it even easier to connect and start using this system. This receiver can process 4K, Ultra HD and 3D passthrough, which allows you to enjoy an unequalled experience of intensely clear and lifelike detail in your movies and videos. The dual-band WiFi and Bluetooth come with dual-diversity antennas. This means that the sound coming from your music streaming will always be of a high and unrivalled quality, even if you’re in an RF congested location. It also comes with built-in HEOS technology, which allows you to wirelessly stream music content from streaming sites and apps, and establish a multi-room network so that you can conveniently operate the receiver from any room in your house. Another neat trick from HEOS technology is AirPlay, through which you can access and play content from your PC, Mac and/or iOS device throughout your home network. And with the Denon AVR Remote App, you can conveniently operate your receiver’s settings from a smartphone or tablet device that’s been connected to the established integrated network. The receiver delivers crystal clear sound with little to no distortion, thanks to the 125-watt sound power capacity of the 9 speaker channels. The channels also feature a low impedance amplifier, which ensures the delivery of powerful sound with absolute lucidity and offers a completely immersive surround sound home theatre experience. The setup on this is remarkably easy and quick. All you have to do is use the Quick Guide to walk you through the simple process of plugging in the receiver, connecting an HDMI that transmits to your TV, and then connecting your wireless home network from there. While doing this, your receiver will also be calibrating and seamlessly blending the speakers to ensure that they deliver scrumptious sound that reaches every nook and cranny within your home theatre space. The receiver also comes with the ability to avoid wire cables and connect wireless speakers instead. You can then place and operate the speakers from anywhere, even single speakers in a particular space, and then operate it using the ‘separate zones’ feature. ​One issue of this receiver is the fact that sometimes when you turn it on, it can struggle to process sound even though the video content is already showing. You can rectify this by turning it off and on again, but then that compromises the quality of the unit over time. ​On certain occasions, the receiver will process only the video content for the first few seconds, with the sound only kicking in shortly after. This might interrupt the content and prohibit the viewer from enjoying a seamless viewing experience. The Bluetooth and HEOS technology often struggles to connect with mobile devices, and requires the user to switch off and reconnect the devices in order for it to work at all. Another quality offering from Denon, this 7.2 channel receiver boasts a maximum of 150-watt sound power capacity. It has wireless HEOS multi-room connectivity technology and a full-rate passthrough that includes 4: 4: 4 power resolution, 4K visual processing and Dolby Vision and Atmos. Bluetooth and WiFi connectivity allows you to wirelessly operate the settings on the receiver from any location in your house. It’s also compatible with Apple Airplay to connect with and play content from mobile devices like iPhones and iPads. From here, you can stream music content from streaming sites and apps like SoundCloud, Tidal, Napster and Deezer, as well as from online radio streaming sites and apps. Other features include 8 HDMI dual inputs and outputs, HDCP 2.2 support and High Dynamic Range compatibility. All these features enable you to enjoy a private home theatre-quality film-watching experience in the comfort of your living room. 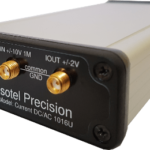 This receiver is also quick and easy to setup and can be effortlessly operated, even by the most inexperienced user. The Auto Eco feature on this alerts you to the power level, which is automatically altered according to the volume level as well as the power consumption. But rest assured, this won’t affect the viewing quality. You can also use the Audyssey MultEQ XT room acoustic measurement system feature to determine the volume output and clarity of each speaker and tweak it to achieve seamless integration and balanced sound. This receiver comes with Bluetooth and WiFi connectivity to establish multi-room home network and enable full control of the receiver from anywhere in your house. Plus you can use the same feature to listen to online radio and stream your favorite content directly from your mobile device of choice. It delivers rich and crystal-clear sound from the base to the dialogue, thanks to the 7.2 channels and their 150-watt sound-processing ability. With this receiver, you can easily enjoy high-quality 4K visuals from any source, including analogue and digital SD content. This is complemented by futuristic High Dynamic Range technology and Dolby Atmos compatibility, which invokes a surround sound home viewing experience. All 8 HDMI inputs and outputs are optimized for compatibility with future innovations in 4K, HD and other audio/video technology. Save energy with the AutoEco feature. This automatically alters the energy consumption of your receiver based on the volume levels and power usage. The menu interface could use some improvement, particularly in increasing the resolution quality and clarity of the icons. The sound quality could also use some improvement. Audiophiles probably know that Onkyo is one of the most prestigious names in audio equipment manufacturing. With this receiver, the company has managed to reinvent itself to meet modern technology standards. It sports a unit that features improvements like better 4K and Ultra HD compatibility, wireless streaming through Bluetooth and WiFi and built-in Chromecast. It also features AirPlay to directly stream audio and video content from your Apple mobile device through iTunes. Apart from these bells and whistles, this unit delivers some pretty solid features, including 8 HDMI input and 2 HDMI output capacities, with channels that can handle powerful sound for up to 200 watts. Other features are Dolby Atmos, Dolby TrueHD, LipSync, Multichannel PCM and Deep Color TM for improved color quality and vibrancy. There is also the AccuEQ feature, which you can use to balance the sound and properly calibrate the speakers, while the Multi-Zone feature enables you to distribute the speakers throughout your home while seamlessly operating them wirelessly. The built-in Multi-Room Wireless technology setup is a convenient way to remotely control your system using your mobile device, and takes away the need to use the device’s actual remote, which may not be on hand with you everywhere. Plus, with the Whole House Mode, you can choose to play music in all areas of the house to create a seamless ambience that permeates throughout your home. High Dynamic Range and HDCP 2.2 provides a next-level viewing experience next to no other. Meanwhile, THX certification conveys high-quality audio with low impedance, low distortion and sparkling clarity. This feature also boosts the range, precision and detail to deliver a truly dynamic sound and a stimulating viewing experience. When paired with DTS:X, the Dolby Atmos feature is able to clearly convey the tiniest detail in sound from the silent purr of a flowing stream to a high-pitched bird call. It’s a totally realistic experience. It comes with a 3 year warranty that covers parts and labor. It’s easy to set up, and quietly hums while operating so that it doesn’t make any disturbing sounds that can overpower the audio that you’re playing. The Dolby Atmos and DTS:X feature provides remarkably detailed sound with surround sound accuracy and vividness. Accompanied by the 4K and Ultra HD visual capacity, this receiver delivers a viewing experience that makes you feel like you’re watching the film or video in a commercial theatre. The interface is super interactive and easy to use. It also responds pretty quickly and is a very intuitive piece of A.I. It’s also lightweight and easy to carry. The channels can power up to 200 watts of smooth but electric sound power. Unfortunately, this receiver is unable to equalize sound during variations in volume levels. The sound remains louder during commercials and super loud movie soundtrack intervals. This is the ideal receiver for sophisticated users and an excellent example of a product built with the utmost attention to detail. Some of the most notable features include the 6.1 channels that have 200 watt sound power-processing capacity through 8-ohm speakers. It also comes with Dolby Atmos and is DTS:X enabled to deliver surround sound-quality audio to accompany the Ultra HD passthrough, which includes 4K, 4:4:4, Dolby Vision and 24bit compatibility with HDCP 2.2 support. To synchronize the sound in multiple speakers across different rooms, you can use the MCACC Auto room tuning with phase control, which also creates awesome recording studio-quality acoustics experience in your living room. The Bluetooth and WiFi allows you to wirelessly stream audio and video files from mobile devices like smartphones, tablets and laptops, regardless of whether it is offline or online. Online streaming includes radio tuning and access to streaming services like Tidal, Spotify and Deezer. Chromecast and AutoConnect are also great features to centrally operate the settings on the receiver to manipulate different speakers in multiple locations across the house. Another nifty feature is the Reflex Optimizer, which navigates the sound emanating from the speakers according to the direction, leading to a more comfortable sounding audio. Lastly, the Phase Control further synchronizes the sound to better manage the bass and control the sound as it travels between speakers. This leads to a well-composed and seamless sound quality. - The surround sound quality on this receiver is absolutely divine. The MCACC feature really works overtime to deliver seamless and crisp sound through fine-tuning phase control, which instantly applies to balance all the speakers regardless of their location in the house. - You can operate the receiver remotely using the Multi-Room Fire Connect features, while Chromecast and AutoConnect enable you to remotely access the streaming capability of the receiver to operate the speakers in any location. - It delivers surround sound quality audio accompanied by high-quality visuals through 4K, 4:4:4 and Dolby Visual compatibility. When combined, these features make for a one-of-a-kind viewing experience. - Enjoy internet and online radio as well as online music streaming with built-in dual-band WiFi. Setting up this receiver is not as quick and easy as one would expect; however, the user’s manual does ease the pressure for novice users. It only offers connectivity for 6.1 channels, a capacity that limits the ability of the receiver to connect with more devices that might become part of your home entertainment system in the future. This Yamaha receiver delivers epic surround sound quality through features like Dolby Atmos and DTS:X. It’s fully compatible with 4K and Ultra HD passthrough so that you can enjoy the best that these technologies can offer. You can play music on your favorite streaming services, like Tidal and Spotify, through WiFi, or opt for offline mobile streaming through Bluetooth, AirPlay and the AV Controller App. If you’re concerned about quality and clarity, then you’ll be glad to know that it also comes fully equipped with sound-balancing features like Volume Equalizer, hi-res audio support and Compressed Music Enhancer for that pleasant studio quality sound. Not only does it feature 7.1 channels, but it also offers the option to spread the sound and distribute it across multiple speakers in different rooms. To control audio in the consecutive rooms, there’s a dedicated Zone 2 Audio feature which comes with extra bass, volume equalizer and main zone sync, which you can use to coordinate the sound from the main receiver to the speakers peppered around the house. It also comes with 6 HDMI inputs and one output, which come with HDR video, BT.2020, and HDCP 2.2 support. There’s even a Phono input that you can use to connect a turntable to play your vinyls, and a Party Mode setting which has been configured to deliver sound that really brings the house down (in a good way, of course). This receiver is so versatile and cool that you can even connect it to a turntable! Imagine all the fun you could have with a turntable, super bass and surround sound sensation. Epic! Enjoy immersive studio quality sound in up to 9 additional rooms by activating MusicCast, a feature that allows you to enjoy evenly distributed sound across different speakers in several rooms. The sound quality on this is truly on point, featuring surround sound made possible by Dolby Amos and DTS:X. Using extraordinary attention to detail, this sound technology delivers an extraordinarily dynamic and multi-dimensional sound. It also offers full 4K and Ultra HD passthrough via HDCP 2.2 and BT.2020 support, delivering realistic visuals, vivid color and amazing contrasts. Streaming is made easy through built-in WiFi. But if you’re not able to connect to the internet, you can use Wireless Direct to play audio through your mobile devices using AirPlay and the AV Controller App. It delivers distortion-free sound with absolute clarity. You can select Eco Mode or Standby to reduce energy consumption by 20%. ​The owner’s manual come in DVD format only and there’s no printed version available, which can be a peeve for those who prefer reading hard-copy documents. Plus, it’s more convenient and accessible to have the owner’s manual in paperback. This Yamaha receiver sounds great with any speaker combination, and comes with digital inputs that are able to process and deliver an immaculate and dynamic sound. It comes with an MM phono cartridge that allows you to connect a turntable and enjoy both analogue and digital vinyl, and a USB connector on the front panel to connect mobile devices and USB thumb drives. The digital inputs are compatible for both Blu-ray and TV outputs, while the solid quality promised by this receiver is backed up by technology features like 5.6 MHz DSD, AIFF and hi-res audio processing through Burr-Brown 192 kHz / 24-bit DAC. You can spread out the music audio experience throughout your house using the MusicCast feature and a few extra speakers or sound bars. Other awesome features on this receiver include unlimited streaming through WiFi, Bluetooth and Wireless Direct, 80 watt by 80 watt sound power capacity with low distortion, low impedance (ToP-ART), and the capacity to handle 8ohms speakers. This review would be amiss if we didn’t’ mention the stunning design of this spectacular machine, with its super interactive interface, silver hairline textured surface and smooth control knobs with a sleek finish. - Linking this to WiFi, Bluetooth and AirPlay is an effortless exercise, and this feature performs flawlessly to stream music and internet radio from some of the best online platforms available. - Setup is quick and easy. - The receiver can handle 8 ohm-speakers and has 80 watt sound power capacity. - It comes with several inputs to help you enjoy a wide variety of entertainment, including an MM phono cartridge, front panel USB connector, and digital inputs with TV and Blu-ray compatibility. - MusicCast feature allows you to enjoy high-quality sound from anywhere in your house. Unfortunately, this receiver cannot handle being turned up to an extremely loud volume, and automatically shuts itself off when the load gets too much. It also heats up from regular use, which then affects the quality of the sound and overall performance. ​It doesn’t work well for large spaces and is best suited to a more compact environment. ​The MusicCast app capability could use some improvement, as it tends to be problematic and is not intuitive enough. With 5 channels processing 50 watts of power each, it’s safe to say that this is a rather modest unit. But it packs a punch when it comes to the quality as it delivers a low-impedance sound with 4-ohm speakers. For example, it has full-rate 4K/ 60 Hz passthrough, super clear and vibrant 4:4:4 color resolution, and HDR and BT.2020 support. Apart from the mentioned inputs, it also comes with 6 HDMI inputs, with one being placed on the front, and Dolby TrueHD for an unmatched cinematic experience. There’s also built-in WiFi and Bluetooth, as well as HEOS integration to calibrate the sound and create a synchronized and seamless audio and video viewing opportunity. You can also stream music from your private library using Bluetooth and AirPlay. Other features include high-resolution surround sound, DTS-HD Master Audio and the Marantz 2016 AVR Remote app, which you can download and use to remotely control the receiver’s settings from anywhere in your house using your mobile device. Despite its compact size, this device proves that dynamite comes in small packages, as it delivers surround sound quality in multiple rooms through HEOS technology. It has a sleek, attractive and innovative design. It features 6 HDMI ports alongside 5 channels with 50-watt sound power-processing capacity. It has 4K passthrough with HDR and BT. 2020 support. Airplay and Bluetooth allows you to play music from your own mobile playlist wirelessly, while WiFi connectivity enables music streaming through online streaming services like Tidal and Spotify. The sound quality is superb, very clear and genuine-sounding. The setup to use the HEOS technology speakers can involve an intricate and difficult process. 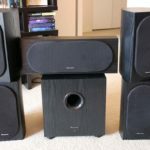 The 5.1 sound is definitely not recommended for bigger spaces. With only two 100-watt channels, this powerful receiver from Yamaha comes with subwoofer support and Yamaha’s signature design. This includes super low distortion and automatic frequency level adjustment to balance out the sound throughout different volume levels. Hook-up conduits include a phono input, 6 RCA inputs and a CD player to enjoy a variety of audio entertainment. You can expand the sound onto a second room using the Dual-zone support feature, which is great for when you’re having friends over for a get-together and you want everyone to enjoy the same music quality throughout the house. Setup is super simple thanks to gold plated jacks, and it also comes with Sirius XM radio built-in and with over 40 stations to choose from. Heart-thumping bass is at your fingertips with this receiver, which features specialized subwoofer support alongside two 100-watt channels. Enjoy detailed and distortion-free sound with automatic frequency control, which balances the sound across all volume levels. Experience the same music quality in more than one area of your house with Dual-zone support. It has built-in Sirius XM radio for your entertainment pleasure, with over 40 stations to choose from. It features 6 RCA inputs, a CD player as well as a phono input for your vinyl collection. ​It doesn’t have any built-in network capability such as WiFi and AirPlay, and Bluetooth has to be connected through a wire. ​It as requires a radio tuning kit in order to enjoy the built-in Sirius XM radio feature. There’s no USB port or even MP3 support. Having a home entertainment system that incorporates surround sound is an ideal way to enjoy realistic sound and movie-theatre like experience from the comfort of your home. Surround sound systems offer a wide range of sound possibilities which you can choose according to your preferences. There’s your average 5.1 and 6.1 speaker arrangement, which is what most living room setups opt for. 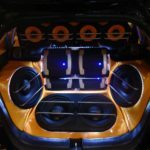 Then there are more elaborate arrangements from 7.1 up to a whopping 11.1 speaker system. These would probably fit perfectly with a ‘fully-equipped’ home movie theatre room and certain Blu-ray movies that are pre-programmed to optimally operate on a 7.1 and higher setup. In case you’re wondering, the .1 reflected in the description of these speaker systems refers to the subwoofer which usually comes with the speakers. The number of speakers themselves is provided as the value before the .1, i.e. 5.1 mean 5 speakers and 1 subwoofer, and so on. 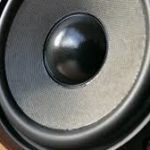 Although one subwoofer is sufficient to provide a decent heart-thumping bass, some sophisticated arrangements come with two subwoofers, and are a favorite among serious audiophiles. To realize true surround sound potential and get the most out your favorite movie sound tracks, opt for a receiver that comes pre-programmed with Dolby Digital and DTS sound-processing capacity. To ensure that you get the benefit of all these surround sound features while eliminating the need to find a matching sound system, try and find a receiver that comes with its own set of speakers. Another good tip is to purchase a surround sound system whose power complements the size of your room, keeping in mind that a powerful surround sound works well in a spacious area, while a modest system with moderate power is enough to cater to the average living room. 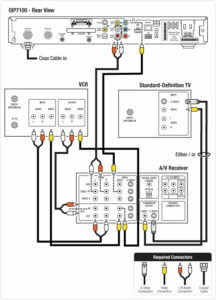 The number of inputs you need your receiver to have depends on what you’ll be using it for. The more varied your entertainment needs are, the more inputs you’ll require. Since technology is always evolving, a general rule of thumb is to purchase a receiver with more inputs than you require in order to make room for the future expansion of your entertainment system. HDMI is an all-inclusive cable that is able to transfer audio and video signals from several devices such as computers and gaming consoles. It is often the only additional output you’ll need apart from the ones you’ll be using immediately. Some models even come with more than one HDMI output to enable easy adjustment between TV and projector. If being able to enjoy 3D entertainment is a priority for you, then be sure to buy a receiver with 3D signal processing capability. 4K quality is the new trend when it comes to visual technology, and it’s not hard to see why, as it delivers high-definition visuals with lifelike detail. To ensure that your receiver is compatible with 4K technology, look out for the ‘4K passthrough’ output, which comes as a standard built-in feature for modern-day receivers. This matches with the 4K TV cable that comes with 4K TVs. On the other hand, a receiver with upscaling makes it possible to upgrade video with lower resolution to high quality 4K or 1080p. These features are nice add-ons, but there’s really no need to pay extra just to have them, as they’ll probably get passed out by more sophisticated technology in a few years. Additionally, HDMI is the only extra feature you really need in order to adapt to the changing requirements of future entertainment systems. A good-quality receiver acts as the primary center of the entire home theatre system. It connects speakers to video and audio components while delivering surround sound quality and tuning radio stations. With a superior receiver, you can enjoy all the features that come with that Ultra-HD TV, super speakers and other awesome devices and equipment that you have. The power capacity of a receiver determines its ability to deliver voluminous sound with clarity and little or no distortion. A receiver with a high wattage rating will typically offer powerful sound that remains balanced across low, medium and maximum notes. Ensure that the receiver you purchase is able to handle not only the powerful sound capacity of the speakers but can also clearly convey the sound throughout the room in which it is housed. Generally, large spaces require a more powerful receiver to deliver a more powerful sound. The receiver should have several inputs and outputs to accommodate a variety of equipment and devices. It should allow you to connect to several components at once, from TVs to speakers, mobile devices and gaming systems. There should also be extra inputs and outputs just in case you choose to add more devices to your system later. Also ensure that you get a receiver with the right type of inputs for the equipment that you currently have in your home entertainment system. There’s no use getting a high-end receiver if it doesn’t connect all your devices. Another important point to note is that a receiver with digital connections is more able to deliver quality audio and video than the legacy analogue versions. Again, an HDMI connection is a must-have if you really want to reap the benefits of all your high-end HD and 4K enabled technology. Having a user-friendly interface is one of the most important elements of a well-made receiver. The setup and operation of the receiver should be simple and straightforward, with easy to understand and clearly defined controls, and a visible display that you can easily navigate. A graphical interface is great, but what’s even better is a receiver that comes pre-programmed with different display options for information like music playlist, movie information and album art to name but a few. As mentioned, Airplay compatibility allows the receiver to wirelessly process content from apps and services that are accessed through mobile devices. This means you can choose between streaming music from your iPad or directly from streaming apps like Spotify and Pandora. Therefore, the Airplay feature is a must-have for music aficionados who enjoy storing and playing music from these digital platforms. A good-quality receiver is relatively easy to setup, even for the most inexperienced user. Some models come with automatic speaker calibration, which is the ability to instantly fine-tune and balance the sound once speakers have been connected. By examining the spatial relationship of the speakers to the surrounding environment, the receiver self-corrects to eliminate any kinks in performance. This ensures that all the connected devices are operating to their ultimate potential. If any of the components are not connected, you’ll be able to tell, as the receiver will either eliminate its participation or alert you. 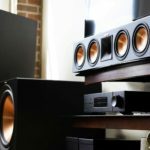 This makes for incredible ease of use, and works equally well for modern surround sound systems as well as more antiquated home entertainment systems.